Acar'Up Anti-Mite 300 ml spray order online. 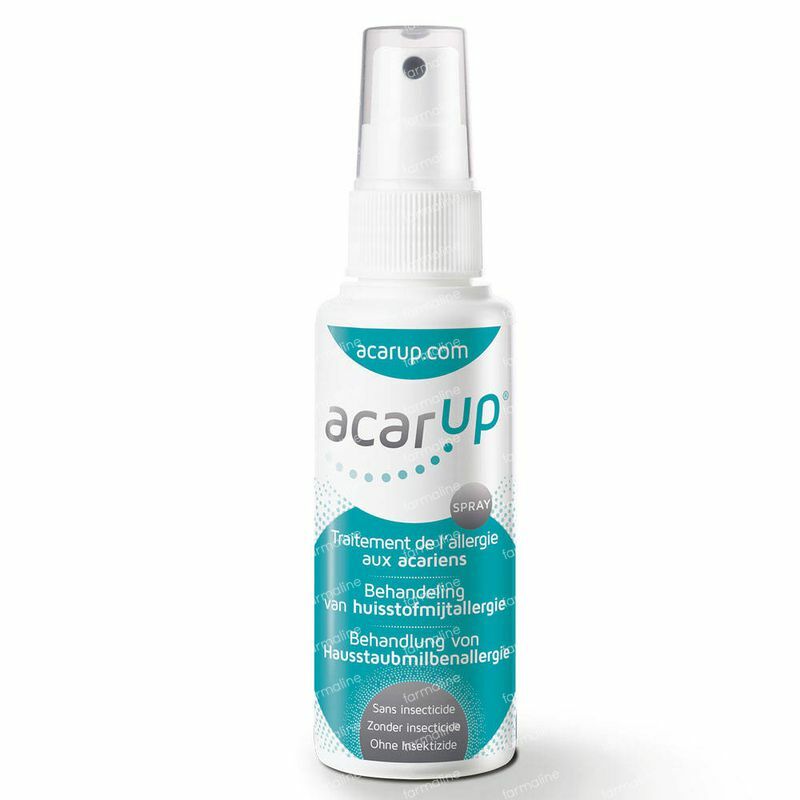 Acar'up is a trap system that is very simple to use, and which is intended to remove and destroys the allergenic dust mites in mattresses, sofas, carpets and furniture in all fabrics. It is a technical fabric that is laid on the bed or the cleaning furniture. This technical fabric is sprayed with a solution containing special molecules that attract dust mites. This happens with an atomizer (spray dispenser). The mites are attracted by the pleasant smell and hides in the fabric, which then goes into the machine to remove them. After washing, when the fabric is dry, it can be placed on another mattress, and then re-establish the solution, so the dust mites can be cathched again. Remove the bedcovers/technical textiles and make sure it stays on the mattress and the pillow. Put the ACAR'UP technical textiles on the mattress and the pillow, with the curly side of the fabric on the mattress. Spray the attractive solution ACAR'UP, at the rate of one dose per square, at a height of about 30 cm. So 8 total doses attractive solution should be sprayed. A higher amount will not ncrease the efficiency of the product. After two hours, remove the technical textiles and put it in the washing machine at 60 ° C, with soap. It is recommended that the duvet cover and cleaning happens simultaneously. Vacuum the mattress to remove the recent dust mite faeces. A very good product that doesn't really contain enough, but it works! The kit doesn't contain enough of the spray to use it for long, you really need to get the refill instantly. This is a solution against dust mites with a great efficacy. You just spray the bottle onto the blanket you get in the package and then leave it for 2 hours, before you toss in into the washing machine. We have faith that this is indeed a good product. We do feel that allergic reactions at night are less already. It's hard to test sadly, but if these products have a scientific validation, then it's worth trying out!